Jean is joined once again by the master of podcasting himself, Jonathan Rivera. 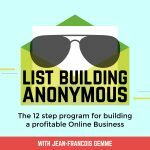 Jonathan is no stranger when it comes to growing wildly profitable online businesses for himself and his clients. The main reason he’s seen such phenomenal results in the past all comes down to first understanding who his target audience is. This episode is jam packed with useful insights and information you can literally swipe and deploy into your own online business today.